Engraveit As Seen on TV! Now you can identify everything from your laptop, to your wedding band, to your child's lunch box with EngraveIt! This engraver tool is so easy to use; anyone of any age can use it! Engrave It engraving tool is strong enough to engrave any surface, but is still safe enough to touch to your finger! Because EngraveIt is an engraving pen plus an etching tool, it's perfect for anybody who loves arts and crafts! You can engrave or etch anything onto any surface - from wood to plastic, and glass to metal! With this hand engraver, the possibilities are endless! Instead of marking your possessions with a permanent marker, or scratching your name onto them, why not beautifully and professionally engrave them with EngraveIt? With your very own engraving hand tool, the beauty of your valuables will be enhanced, not "scribbled-on" or "scratched"! 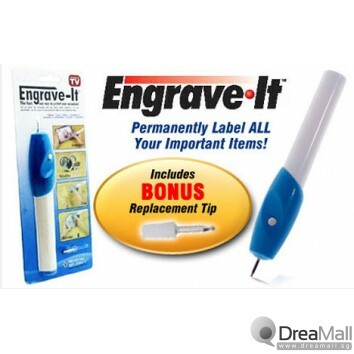 This hand engraver gives you fabulous results every time, so you can feel good about marking all of your valuables permanently! If you would like an easy way to identify and protect your valuables, plus a handy engraving tool your whole family can enjoy, then it's time you ordered your own Engrave It!